Emergency services rescue victims from overturned train cars near a village in Tekirdag province, Turkey, July 8, 2018. 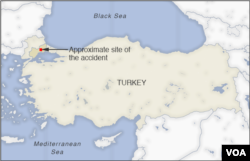 Officials in Turkey say 24 people were killed when a passenger train derailed Sunday. The derailment occurred in the northwest Tekirdag region as the train was carrying 362 passengers and six crew members to Istanbul from Erdine, near the border with Greece. A total of 318 passengers were injured, with 124 still hospitalized. Search and rescue efforts were completed Monday. The Ministry of Transport said five of the train's six cars derailed after “the ground between the culvert and the rail collapsed” because of heavy rain.